It’s an unfortunate fact that, as you age, your muscle mass declines, your flexibility lessens and your balance suffers. A combination of these factors can lead to a dangerous fall — in fact, 2.5 million older people are treated in the emergency room for injuries from a fall each year. One antidote to this risk: regular core training. According to a review of studies published in Sports Medicine in 2013, core strength training can be used instead of or in addition to traditional balance or resistance training programs for older adults. As a result of a stronger mid-section, everyday activities will be easier and the risk of a fall or other injury will decrease. Talk to your doctor about having a physical exam before undertaking an exercise program, as it could identify cardiac risk factors or other physical limitations, such as joint or muscle problems. HOW TO DO IT: Sit on an exercise ball and place your feet firmly on the ground in front of you. Place your arms across your chest and lean back as far as you comfortably can. While engaging your core muscles, twist your torso to the left. Return to the starting position and twist to the right. Complete three sets of 15 repetitions each. If that's not possible, work your way up to that number. HOW TO DO IT: Sit on a mat on the floor or, if that's difficult, on a bench. Moving slowly and purposefully, bring both your knees toward your chest until your legs touch your abs. Return to the starting position. Work your way up to three sets of 15 repetitions. HOW TO DO IT: Get down on your hands and knees, ensuring that your weight is evenly distributed at both points. Engage your core and extend your right leg back so it's hovering slightly above the ground. Point your toes. While keeping the leg straight, lift it as high as you can without arching your back or feeling any pain. Lower your leg to the starting position. Repeat on the other side. Aim for three sets of 10 repetitions. 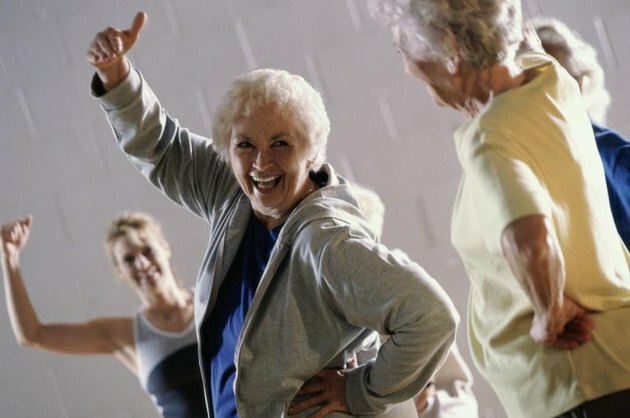 In addition to core-strengthening exercises, older adults should engage in at least 150 minutes of moderate-intensity aerobic physical activity, recommends the World Health Organization. This activity should be done in bouts of at least 10 minutes at a time. HOW TO DO IT: Start by lying on your back with your knees bent and feet flat on the floor, positioned hip-width apart. Push your lower back into the floor and contract your abdominal muscles. On an exhale, lift your hips off the floor until they form a diagonal line from your knees to your ribcage. Don't overextend your hips, which can harm your lower back. Press your heels into the floor to keep stable. Inhale and return to the starting position. Repeat for a total of 10 reps.